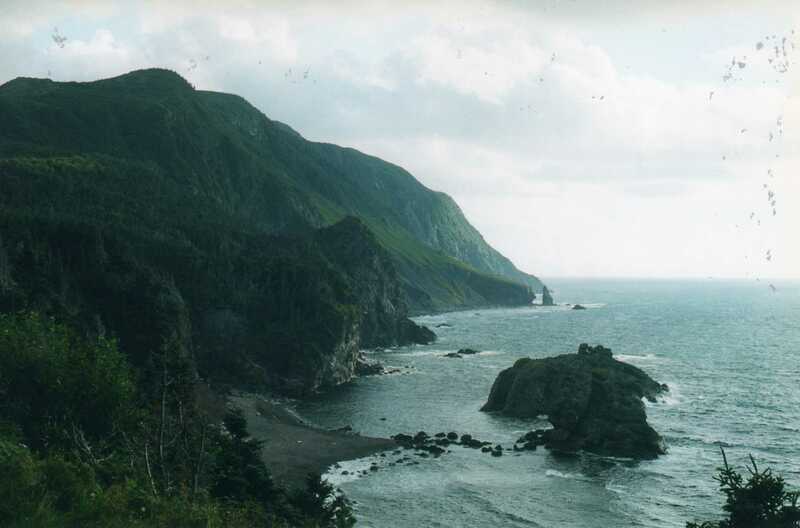 Years ago Art and I visited a place in Gros Morne National Park in Newfoundland, called Green Gardens, a spectacular stretch of volcanic coast with stupendous coal-dark cliffs crowned with lush, velvet-green meadows and wind-twisted spruce trees. We camped for two days under a half moon that lit the sea foam below as it swirled in and out of sea caves and skirted tall stacks of lava pillows. The cliff-top meadows were once summer pasture for sheep, who still grazed there, though the farms and shepherds were centuries gone. It was a sheep’s paradise, who would select the high points with the best views, we noticed, and bed down at night under the giant white pines. The scotch thistle flowers were in bloom, forming pink banners rippling in the ocean breeze. Lovely, except that the thistle, a plant that the sheep won’t eat, was therefore taking over. The sheep were in effect selectively grazing themselves out of a habitat. That was ten years ago, when we weren’t yet worried about thistle taking over, as we are now. Green Gardens served as a warning. Little by little, another variety of thistle, introduced here when the Monitor Barn was removed, was becoming a problem. This kind does not even have a pretty pink flower, but rears its thorny head like a pair of ugly fangs. Everywhere. Especially around the footprint of the former barn. It is proving to be inextinguishable. We even saw it grow up through a great big pile of wood chips, as if it were clawing its way straight out of hell. And then, another invasive grass that the sheep won’t eat– we call it the jaundice grass for its sickly yellow hue – was becoming even scarier. We considered introducing a pair of goats. But that would involve some serious fencing, if we hoped to have a tree left standing. I shuddered to think what they could do to all the hard work of the farm crews and volunteers next door. Not to mention our laundry. Then we learned about Soay sheep. Soays are a rare breed of primitive sheep that were isolated for two thousand years on an island in the Hebrides. They are thought to be close to the earliest domestic sheep herded by Bronze Age shepherds. They are small, and horned, and resemble deer rather than ovines. Having lived on an island – not unlike the cliff-top meadows of Newfoundland – they would have learned not to be such fussy eaters, once there was nothing left for them to eat but thistle. Soays do not need shearing, for they shed their fleeces naturally, nor nail trimming, and even the rams are gentle, unaggressive creatures which means they don’t need to be separated from the flock. They are a good choice for farmers who are reluctant – as we are – to intervene too much in the lives of our animals, but rather to live with them in a spirit of mutualism. You give me water. I give you wool. Soays at Soli Deo Gloria. 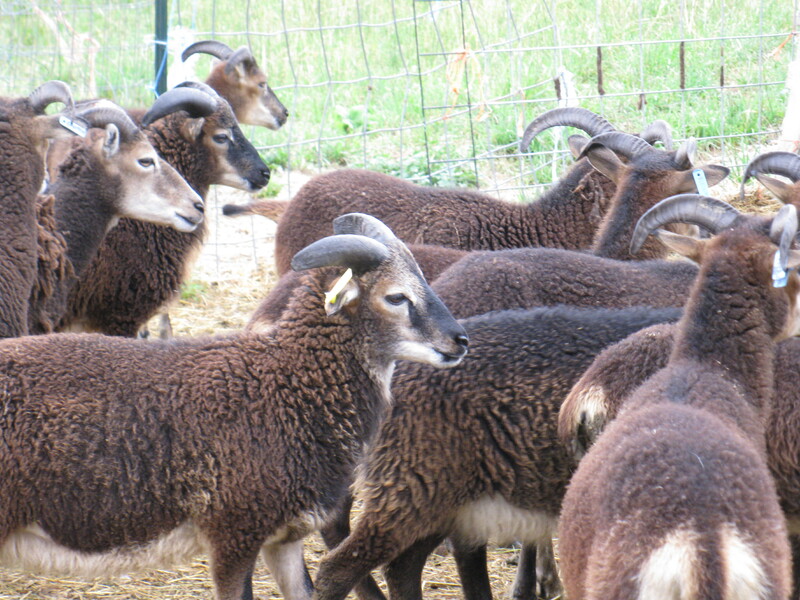 The day came to pick up a pair of Soay wether lambs from the Soli Deo Gloria farm in Whiting. We caught our first glimpse of them in the field – whom I might have mistaken for deer, except for the way they were so tightly flocked together. The farmer led them into a corral, and as he tried to grab one for us, they moved swiftly, swirling around him in a blur like a school of fish around a diver. “They’re impossible to catch,” he said. As we were soon to learn. We brought them home in a U-haul mini-trailer and let them out in the paddock to mingle with the other sheep. They retreated to a hidden corner of the paddock behind the barn, where I stood and watched them for a while and who, in their shyness, returned my gaze. These are animals who will remain calm in your presence, and seem to be as curious about you as you are about them, as long as you move slowly and make no hint of giving chase. Their curved horns sweep back from their faces, marked with white swooshes of war paint, giving them a noble look. I was excited to observe them over the next few days to see how they would adapt to their new home. I got dressed and followed Art down the road and into a thicket of poison parsnip running into a ravine, where the lambs were last seen. We walked up a little streambed into the woods and came out at the edge of the VYCC farm. No sign of them. We explained our situation, and described the lambs to them. “They look like tiny antelopes,” I said. “What’s an antelope?” one of them asked. As it turned out, we were very lucky that the crew happened to be working there that day, who would keep an eye out for our lost lambs. I ran back and there they were, out in the open, noses to the ground like a pair of brown dogs sniffing around. I followed them for a while, slowly, as they made their way down the path at the edge of the woods, and then meandered into the tall weeds where they munched happily on leaves from the low-hanging bough of a box alder. They looked at me, and we exchanged gazes again, and they went on grazing. Like Jane Goodall and her chimps, they accepted my presence as I lingered and observed. I had no way to get them home, of course, but it was a source of hope that they had stayed nearby, and did not take off into the deep wilderness, as we had feared. When Art returned from work, we went back to the same spot and found them again, their war painted faces visible through a slight gap in the weeds, like an image from a Henri Rousseau painting. It seemed fitting that these creatures, at the confluence of the wild and the domestic, should find themselves on the line between forest and farm. They would have everything they could ever want here, I thought – water, shade trees, and good browsing. Everything but a herd. They were, to our horror, choosing to bed down in the exact place where we feed the coyotes. However unlikely our success, we would have to try to grab them. Our plan was for one of us to come around from behind and flush them out of the weeds where Art and Cody – a neighbor who came to help us – would grab them. “Their horns make good handles,” the farmer had said. I crashed through the tall goldenrod and then crept up the streambed and climbed a bank to reach them. To my surprise, they did not notice me until I was standing over them. They looked up at me with those sweet faces, and before I could apologize– they bolted. I grabbed one – but the other got away. He went bounding past Cody and Art up the path toward the lean-tos, graceful as a deer, and then leapt into the woods and vanished. That was the last we saw of him, although we looked and looked, for two days. I got to know the edge of the woods, the little streambed, and the new farm crew and apprentices, who were by now all invested in helping us to find our lost lamb. I could not help but think about him, scared and alone, and possibly lost, in the deep woods. As I focused on my tasks – in the garden, the kitchen, or my desk – those woods were at the periphery of my consciousness, a mystery that would never be resolved. The endless possibilities – some hopeful, some horrific – turned over and over in my mind. Nature, I know, has its cruelties, but we were responsible for this lamb, whom we wrenched from his family, grabbed by the horns, and brought to this strange place with its gang of bully-ewes. In truth, I do not like animal husbandry with all its little brutalities – the wrassling, the chasing, the penning-in. And so much death. There are times when I wonder why on earth we are doing this; this was one of those times. Meanwhile the lamb we brought home settled in. It took only a day for the other sheep to accept him – they were mean to him at first, which is probably why the Soays ran away– the new lamb eager to become a part of the group. Seeing how closely he stayed with the herd, I was hopeful that the other lamb would find his way back to his brother. He did. After two nights alone in the woods, one of them in the pouring rain, he made his way across the open farmland under the cover of a morning fog. We opened the gate for him, and watched as the settled lamb led him proudly, like a college senior showing the way to a freshman, into the barn. Now the two of them are together again, inseparable, and show no inclination of running away. These gentle creatures are teaching us to be gentle ourselves, who will never again give them chase, and should never have reason to use their horns as handles, as they live out their lives here in peace. This entry was posted in feral sheep, Soay sheep. Bookmark the permalink.